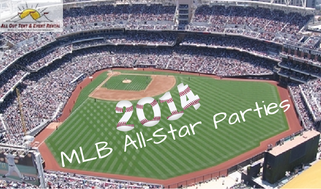 The 85th Major League Baseball All-Star game is set to take place today. This year the event will take place at the Target Field, the home of the Minnesota Twins. Take part as the American League and the National League take the best from their teams and lay it out on the field. Even if you can’t be there in the action, you can still participate with your own watch party. Try out these fun ideas for the 6PM Mountain Time start to get the most from the game. Choosing a color theme is important when planning your party. While these two teams are a conglomerate of a number of different teams, both the National and American leagues are representing the red white and blue. Choose to incorporate these American colors throughout your theme in everything. This can be simple, such as a few balloons, or as complex as you wish it to be. The design of a baseball is relatively simple in comparison with other sports equipment. Instead of purchasing expensive items that have this already printed, make your own. Invest in a white table cloth, then using red paint design the stitching yourself. This same design can be added to anything at your party, helping to bring the spirit of baseball to the event. Set up a chalk scoreboard and update it after every score. This is a fun way to stay involved in the game, and adds another fun decoration to the event. Hotdogs are the quintessential baseball game food. Choose this for the main dish at your part for a fun and simple way to get the feeling of baseball in the room. Popcorn is another essential baseball tradition. You can make it fun by adding caramel popcorn or other flavors as well. For the dessert, find a way to incorporate the signs of baseball. Choose to decorate the cake as a stadium, or use brown frosted cupcakes fashioned into the shape of a mit for your guests to choose from. Here is another place where the simple design of the baseball stitching can be used in food decorations to increase the feeling of the sport. While the All-Star game is happening tonight, that doesn’t mean there isn’t still time to make preparations for your own gathering to watch the game. Get started designing the decorations and the food that will be most important to your party. Whether you are rooting for the National League or the American League, gather together with friends to cheer on your team.